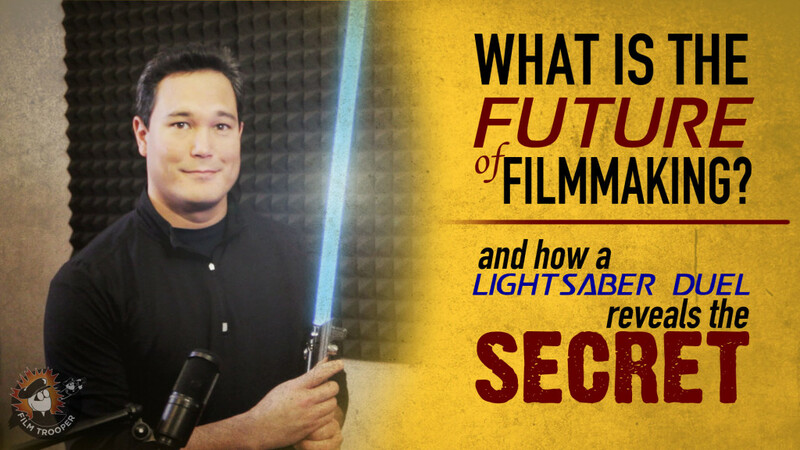 In this episode, I analyze how a short film involving a lightsaber duel reveals the secret to the future of filmmaking. When you sell anything, you are doing business with a buyer. So, it’s important to understand what type of filmmaking business you’re exactly in? 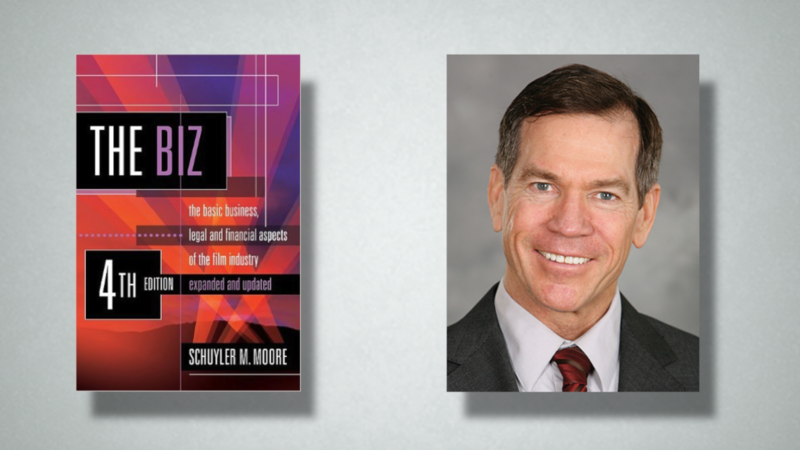 Let me ask you … What business do you think that Hollywood is really in? Many say, show business. But let’s dig deeper. We’re actually all in the business of LICENSE EXPLOITATION. 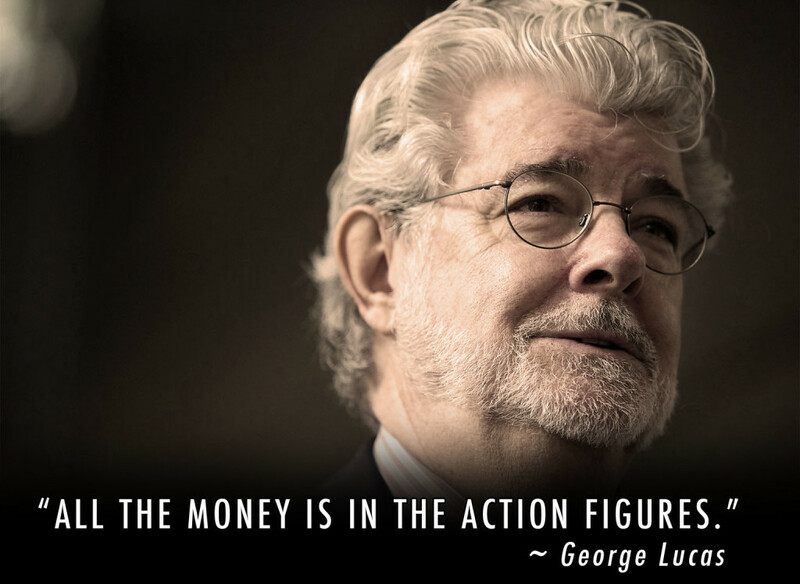 If you owned the Star Wars license, you might make books, video games, TV shows, movies of course, and the cash cow for all of it — the toys! We’re not really in the business of selling films, we’re in the business of exploiting licenses — our own licenses. So, in the end, our films are nothing more than an advertisement. Our job is to use our films as an advertisement to sell something of a higher value. This is the past, present, and future of filmmaking. Not every über independent filmmaker likes the word advertisement, so replace it with “amplifier”. Your film is an amplifier for something bigger. How does all this apply to a film about a lightsaber duel? Watch the video above and go to the 3:00 minute mark. Scrolling through Facebook, I came across this post. There have been other homemade lightsaber films made before, but this was different, because it was new! But if we look closer we can see that this Facebook post is actually a “sponsored” post from a Facebook page called, The Force Is Within You. You want some LightSaber Swords for your kids, don't you? Even Adults have Fun with them! Limited EDITION. You click the link and it takes you to a website selling lightsaber toys! In the marketing world, it’s important to have an aligning marketing message. This whole Facebook post has the correct alignment. It shows you a fun, cool film with twin brothers having a lightsaber duel. The Post capitalizes on the Star Wars craze. It’s in alignment with the psyche of Facebook users. There's a good chance that if you ever clicked “like” on anything related to STAR WARS, your data is stored in Facebook’s analytics. So, when this company needs to target people who like Star Wars, they know their paid Facebook ad will reach anyone who ever “liked” past Star Wars posts. The company paying for these Facebook ads didn’t even make the lightsaber film. In fact, the products they are pushing, aren’t even real Star Wars lightsabers. They’re knock offs! But, they still needed something eye catching to grab your attention to make you want to click on their link anyway. Freebooting is when people are take videos originally on published on YouTube and upload them directly onto Facebook. The problem with this, is that the original creators of the YouTube content don’t get the views that would contribute to their ad revenue. 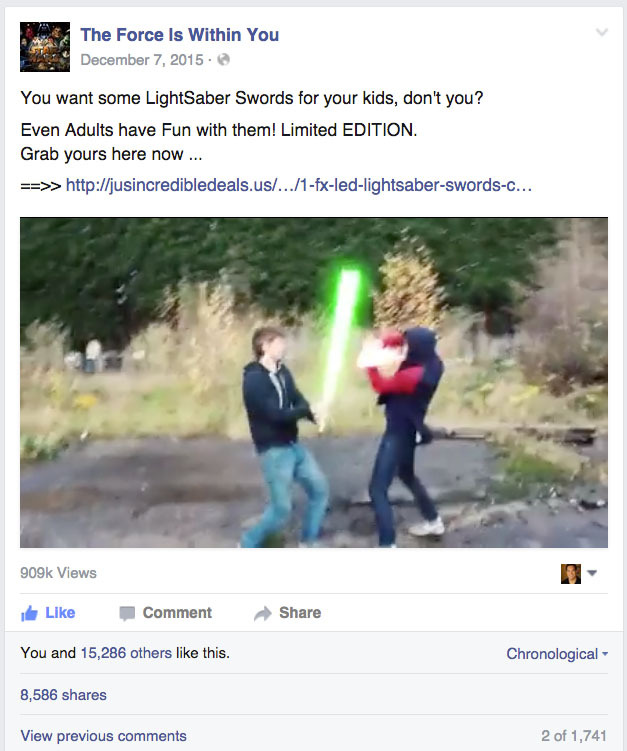 So, this company selling these knock off lightsabers grabbed this YouTube video from Twin Coconuts. Twin Coconuts are YouTube stars and Twin Brothers from the UK. 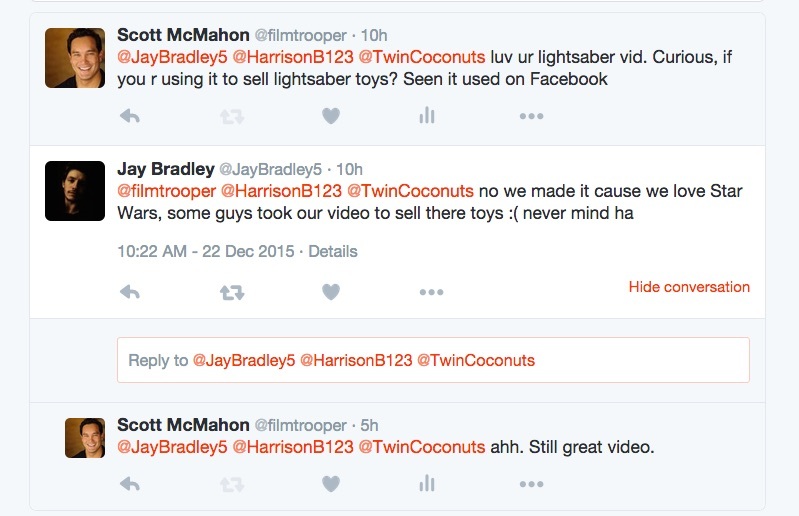 Anyway, this company selling the lightsabers grabbed this YouTube video and removed any evidence that it was made by Twin Coconuts. I know this, because I asked the filmmakers themselves. The tactics used by The Force is Within You doesn’t appear to be illegal ... a little scammy and unethical ... maybe? But the framework of how they are driving traffic to their website and selling visitors the higher priced products is nothing new—this is a standard practice for most online businesses. What would I sell as a product for my short film? Or my dramatic feature film? I go into more detail about different ways to sell your film online with my FREE 3 part video series, The New Adventures in Film Distribution!